on the stage of the Boutell Memorial Concert Hall. 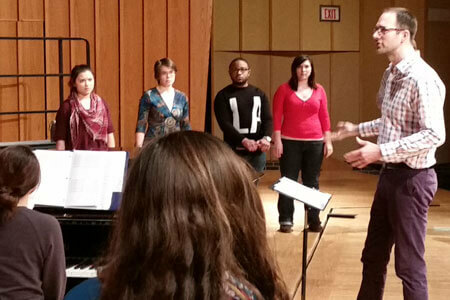 American composer Timothy Takach is in residence at the NIU School of Music Choral Department for the next three days. During his residency, Takach will present an all-school convocation to talk about entrepreneurship as professional musician, meet with students in conducting classes, present a seminar for composition students and work with the NIU choirs in rehearsals. His residency will culminate with a public concert at 3 p.m. Sunday, March 6, in the Boutell Memorial Concert Hall of the NIU Music Buildilng. The performance is free, and the auditorium is accessible to all. The concert also will be webcast. The highlight of the concert will be the premiere of a new work by Takach that was commissioned by the NIU Choral Department. The composition, ”The Longest Night,” is a seven-movement work for choir and string quartet. The composition explores the metaphors of a life journey that begins with the coming of winter and is discovered anew in spring. “I’ve always imagined the winter months as the bottom of a circle, dipping lowest at the new year and then coming back up to find spring. There was never any negativity or depression attached to that image, but I do think it is neat to think about the act of journeying through winter as a descent of sorts,” Takach says of his composition. For more information, email Eric Johnson, director of choral activities, at ejohnsn@niu.edu. Previous Post:Law school admission sans LSAT?